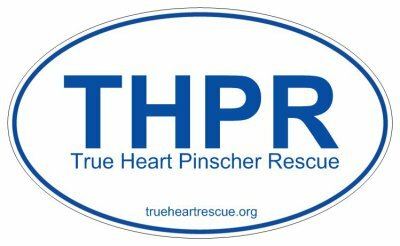 True Heart Pinscher Rescue, Inc.
Want to help a rescue dog, but can’t adopt at this point? True Heart Pinscher has plenty of ways you can help dogs in need. Donations of items, money, or your time are always welcome from those who wish to support our rescue and rehabilitation efforts. Know that 100% of your donations goes directly to the rescuing, vetting, and care of our rescued dogs. Our volunteers are never paid for their time. Most of our dogs come to us with nothing. No toys, no leash, no bed to call their own. If you would like to help a dog in need, but are unable to volunteer at this time, and would prefer to donate items, True Heart welcomes your assistance. Shop for friends, family, or yourself while donating to True Heart Pinscher Rescue. All proceeds from these items go to cover vetting, spay/neuter, and preventatives for our dogs. Join the True Heart Pinscher Rescue Family and help a dog in need today. Wondering why you should foster? saving the life of a dog. helping us learn more about the dog so he or she can end up in the best home possible. socializing the dog to a home environment and increasing the likelihood his adoption will go smoothly. We have added a Auction groupo to our list of Facebook Groups. Two or three times a year we will have a bid-only auction to help raise funds for the rescue. All of the money raised will help us to save the lives of more dogs. Throughout the year, we will also post Buy-It-Now items where a single donation will allow you to purchase the item listed. Like the auction, all of the money received from this listing will go to help rescue dogs in need. If you have items that you would like to donate to the auction or Buy-it-Now listings, please send us an email through the link below. Be sure to include a good photo of the item, a brief description, and any special instructions for shipping ( e.g. US only, buyer pays shipping costs). We appreciate your donations. If you need a receipt for your item, please let a True Heart Representative know. We will be happy to provide one for you.